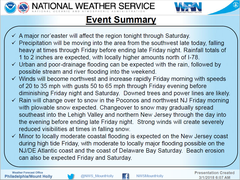 Nor'easter may bring rain, snow, flooding & high winds Thurs night into Saturday. Prepare now. Nor'easter to bring rain, snow, flooding & high winds Thurs night into Saturday. A Flood Watch is in effect from late tonight into Saturday morning. A High Wind Watch is in effect from Friday morning into Saturday morning. 20-30MPH sustained winds, with gusts to 60MPH may result in downed trees and power outages. 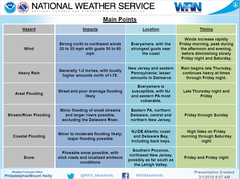 Be prepared for multiple hazards including heavy rain, snow, flooding, and high winds. Be sure to secure loose items on your property.